One of the things that I love most about being a Freelance SEO Copywriter is the fact that I can work from home; it’s great, everyone should do it! Having previously worked in large, open planned offices with lots of people, all having different conversations either with each other or on the phone, being able to work in the peace and quiet of my own home is bliss, plus I’m at least twice as productive as I used to be. Of course there are downsides, I’m not claiming that it’s an idyllic utopia; if my son’s at home, he never stops talking and my dog has a serious wind problem, but apart from that it’s pretty good (and I can always lock them in the chokey if it all gets too much). So this is what has brought me to today’s blog post; I am going to write a sensible blog post shortly about the benefits of Freelancers who work from home, as opposed to those who work for agencies in ‘trendy’ open planned offices but, as it’s Friday (and as my son hasn’t stopped talking to me for 2 hours and the dog’s in the chokey) I thought I’d just ask a simple question that has been bothering me all week! Which is best – summer, when you can work in the garden, sitting in the sun with an iced drink, or winter, when you can work next to a roaring fire, wrapped in a snugly blanket and with the dogs curled up next to you and keeping you warm? I love being warm, so I love sitting in the sun and there’s something magical about sunshine that manages to drive your demons away and make the whole world look just that little bit nicer. But having said that, being cosy and warm in front of a roasting log fire whilst looking out at the cold world through the window is just so very satisfying, especially if you throw in a lovely hot chocolate. So which season takes the title as the best? I can’t make my mind up! I’ve been veering between the two all week and I fear that the answer may just be that I like summer best in summer and winter best in winter, but that does seem rather to be dodging the answer somewhat. So I’d like you, dear reader, to tell me which season you like best; even if you’re not lucky enough to work to home, you can still let me know whether you prefer summer or winter. I suspect that summer will win, but I’d be interested to hear your reasons why please. Winter. Always Winter. Even though I work in converted portacabins in the middle of a site full of plants and trees, I just love putting on a jumper, coming in to my office and getting warm. I think it’s something to do with the fact I’d rather be too cold than too warm. 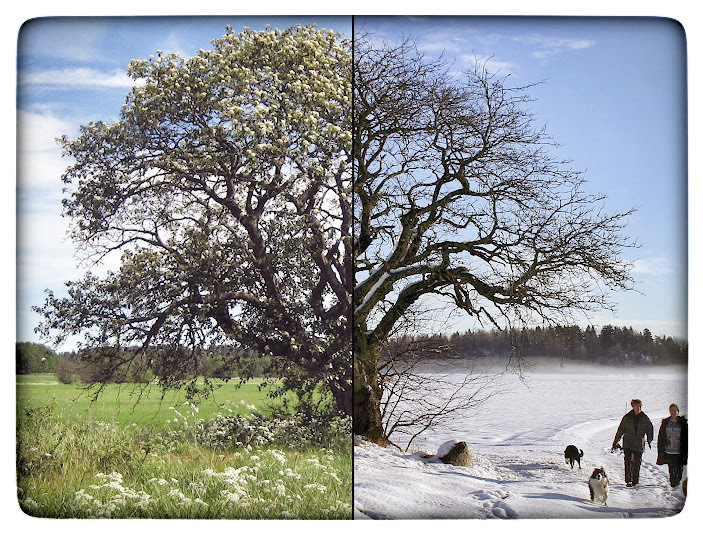 » Which Is Your Favourite Season?